busking, (putting out a hat and hoping for more in it at the end than when you started). Non-Instrumental music is primarily made up of singing, though whistling, humming, and clapping all qualify as well. England's Henry the second's favorite performer was famous for his ability to "flatulate tunefully" (not that we're advocating that sort of thing...). Singing can range from mournful love songs to bawdy ballads; from sacred church hymns to rousing marching anthems; as a group, or solo. it's all welcome in the SCA. Also associated with Music are the Bards, (a term we use roughly to mean "entertainers"). Bards do sing, play musical instruments and such activities, but they also are known to tell stories, recite poetry, juggle, perform magic, and a myriad of other manners of entertainment. 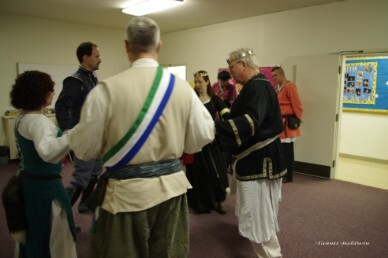 Dances are documented activities that were important during many eras that the SCA re-enacts, including several where it was expected that noble ladies and gentlemen knew how to dance. Much of a peoples history and culture can be discovered through the study of their dance (just look at Italy and England in the later middle ages). Within the SCA there are those who dance for the social joys that come from dancing. Costume balls are held, period instruments are used and, for a while, we enjoy this aspect of the past. But society was different then. Dance was not always a social activity for large groups of people. Those who are drawn to historical accuracy know that dance was partly a social contest. Today we show stature by how large and fancy our house or car or cottage is - but in some eras it was all about dance. or the artist within the SCA - dance is a form of expression to be explored. At times we have contests to see what can be done with a dance. John Playford (an English Dancing Master from 1651) may have documented in his book the movements of people required to perform a certain dance but there was so much more he didn't document: Which instruments were used? Should the music be light, sombre or something in between? Should a couple dance exactly together - or perhaps just keep missing each other? By playing with the form of the dance it can become a vivid expression of happiness or sorrow in that the partners just never wind up together or something else again. For the "clothes horses", dances can be a way to show off wonderful garb (dance is at its best at a costume ball)! 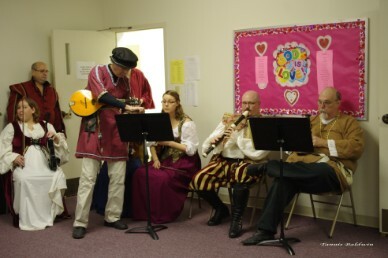 For musicians it can be a challenge to play or learn to arrange music in a period style. It can also be an incentive to build or buy period instruments. Dance in the SCA takes many different forms. From the courtly pavannes to bellydancing around a campfire, and everything in between, dance can be many things for many people. 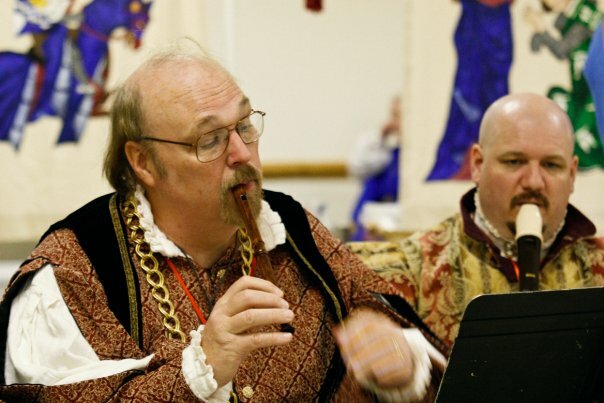 Sir Otto practicing to play for court at Inter-baronial twelfth Night.